One monster. Three innocent girls. Ten years in captivity. 22 August 2002: 21-year-old Michelle Knight disappears walking home. 21 April 2003: Amanda Berry goes missing the day before her seventeenth birthday. 2 April 2004: 14-year-old Gina DeJesus fails to come home from school. 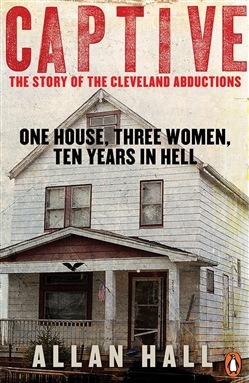 For over a decade these girls remained undetected in a house just three miles from the block where they all went missing, held captive by a terrifying sexual predator. Tortured, starved and raped, kept in chains, Captive reveals the dark obsessions that drove Ariel Castro to kidnap and enslave his innocent victims. Based on exclusive interviews with witnesses, psychologists, family and police, this is an unflinching record of a truly shocking crime in a very ordinary neighbourhood. Allan Hall was a New York correspondent for ten years, first for the Sun and later for the Daily Mirror. He has spent the last decade covering German-speaking Europe for newspapers including The Times and the Mail on Sunday. He is the author of two previous books, Monster, an investigation into the life and crimes of Josef Fritzl and Girl in the Cellar: The Natascha Kampusch Story. He lives and works in Berlin. Acquista Captive in Epub: dopo aver letto l’ebook Captive di Allan Hall ti invitiamo a lasciarci una Recensione qui sotto: sarà utile agli utenti che non abbiano ancora letto questo libro e che vogliano avere delle opinioni altrui. L’opinione su di un libro è molto soggettiva e per questo leggere eventuali recensioni negative non ci dovrà frenare dall’acquisto, anzi dovrà spingerci ad acquistare il libro in fretta per poter dire la nostra ed eventualmente smentire quanto commentato da altri, contribuendo ad arricchire più possibile i commenti e dare sempre più spunti di confronto al pubblico online.